I never knew that an interactive storybook styled game can be so fun until I played Florence on my iPhone. If you have not heard of the game I highly encourage you to try it out. According to the game’s description, Florence is an interactive storybook from the award-winning lead designer of Monument Valley about the heart-racing highs and heartbreaking lows of a young woman’s very first love. I mention this here because I think that the description succinctly defines the game. First, the game is beautifully designed and uses hand-drawn comic styled graphics which is exquisitely drawn for each and every frame of the game. I would not have accepted anything less seeing how this game comes from the lead designer of Monument Valley which is one of the best designed mobile games you can find. Secondly, the storyline of the game is really engaging and keeps you tightly in its clasp as you navigate Florence and Krish’s (lead characters of the game) relationship through a series of mini-game vignette. The only problem with this game till now was that it’s only available for iOS devices, which means a major population of mobile gamers were not able to enjoy the game. 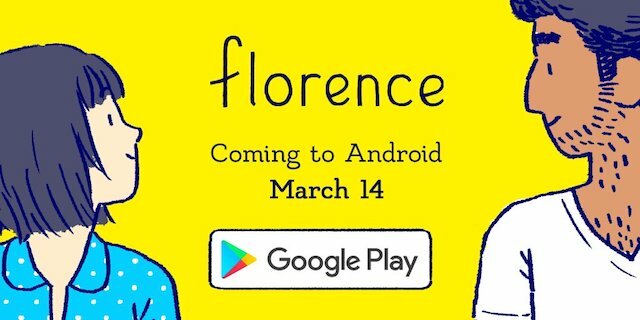 However, all this is changing now as the developers of the game has just announced that they will be releasing Florence on Android on March 14. So, if you were waiting for this game to launch on Android, you should mark your calendar as only 11 days remain before the game hits the Play Store.